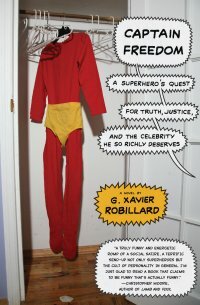 The debut novel by G. Xavier Robillard is now available! Buy it from Amazon or your favorite bookstore now! Captain Freedom is a truly funny and energetic romp of a social satire, a terrific send up of not only of super heroes, but the cult of personality in general. And G. Xavier Robillard isn't stingy with the ideas, which indicates there's good things to come. I can't wait. We've seen alcoholic superheroes, closeted gay superheroes, even homicidal superheroes. But we've never seen the superhero as neurotic hipster fame whore. 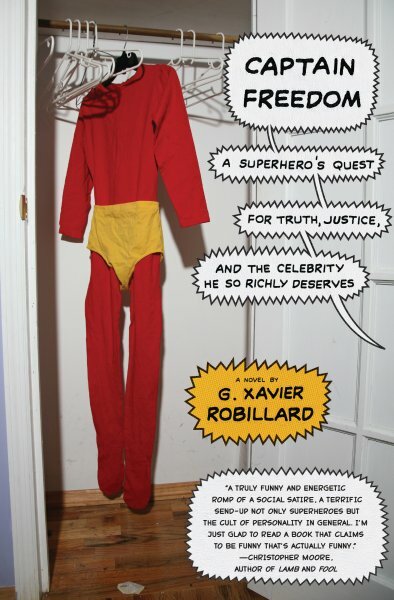 Robillard's hilarious satire goes somewhere new and surprising. --Neal Pollack, author of Alternadad. Freedom's fans gain access to new content (videos, leaked chapters, new posts) first! Want to know when it's hitting bookstores near you? Sign up for an update in our special mailing list. Point Your RSS Reader to the occasional hijinks of the Captain Freedom blog!